The five-foot-seven-inch, suave looking bot called the Smart Robo Cop is equipped with cameras, and an array of sensors connected to GPS in its beta version. HYDERABAD: A life-sized robot, claimed to be the world's first smart policing robot, was launched in Hyderabad city on Friday. 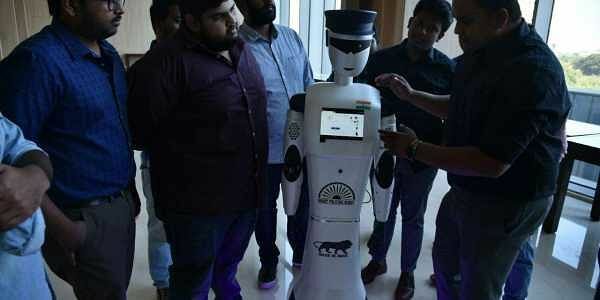 The five-foot-seven-inch, suave looking bot called the Smart Robo Cop is equipped with cameras, and an array of sensors connected to GPS in its beta version and has been developed by H-Bots Robotics, a Hyderabad-based robotics technology company. All the components have been sourced from within the country. It has been created to support security systems in the city and is likely to be deployed by July next year. The robot can move, recognise people, take complaints, detect bombs, identify suspects, interact with people and answer to queries and has been worked on with a 16-member team in the last six months in a lab facility in Hyderabad, which is called Makers Leeway. The lab enables prototyping solutions in robotics. The founder of H Bots, PSV Kisshhan said that the idea is not to replace humans, but that it works as a value addition. Placed in any locality, the robot has been equipped with a system where people can lodge a complaint with the police from where it is stationed. The complaints can be lodged through video, audio and photos. People can also make use of emergency services. For example, an accident can be reported from the spot or even if one wants to complain to the SHE Teams with the help of capture option that is available. A complaint number is provided which can help track the status. There are plans to also integrate the E-challan system. It can also do a 360-degree surveillance, face and gesture recognition and is also said to control theft. PSV Kisshhan said that it can be deployed for security and law enforcement, used in all police stations as an informant and can also be deployed in public places. "We have been provided support from the Assam Police and also the Telangana Police who helped us with information on their operations and also gave us feedback to develop further. We will be testing this on the ground in the next few months, improve it and they will be deployed by June," said Kisshhan, founder of H-Bots Robotics who has been in the field of developing robots for the last nine years. Though the company has made an investment of Rs 45 lakh, they plan to sell it at a cost of Rs 5 lakh. While H-Bots has built in the technology, the hardware building has been outsourced to other start-ups in the country. Currently, they are in the process of building 38 smart policing robots. The company also signed a MoU with an Amigo Group, a company based in Thailand and which has its operations in India, USA and Thailand. The company has invested $1 mn for research and development. "We have given them certain criteria and they will be developing robots based on that criteria. Once they are tried and tested, we will start using them across our hotel and construction businesses in these three countries," informed Chandra Sekhar Avvaru, Chairman, Amigo Group. Telangana State IT secretary Jayesh Ranjan, while appreciating the team said that this robot sends a strong message that Hyderabad is not just the hub for software. "The hardware aspect of it needs to be appreciated, while we need to noted that we have entered the exciting zone of robotics too. This will be supported fully by the Telangana government," he said.